One day, I was visiting a new spa in the Phoenix area with another soaping friend of mine, and as we awaited our bill, we perused some of the beauty product offerings in the spa’s retail boutique. My friend picked up a small bottle filled with a conspicuously blue yet “natural” facial serum and suddenly exclaimed (not just a little loudly in the whispery quiet of the spa environment) with incredulity, “where’s the blue? !” She, a fellow formulator and artisan of her own line of handmade, natural bath and body products, was of course scrutinizing the ingredients label on the product box, because that is what we do. It is a compulsion and we can’t help ourselves, really. As far as I know, there is no 12-step program for this label-reading affliction because it doesn’t really constitute a diminishment of one’s quality of life; it’s just really annoying for anyone trying to get me to walk through any retail beauty aisle at anything resembling a brisk pace. I just can’t do it. I *have* to stop and read the ingredients. Anyway, the problem with the ingredients listing on this particular product, however, was that it was incomplete. And anyone who formulates beauty or body care products for a living can tell this, simply by looking at it. There were actually more than a few little label lies happening in this case, but the most glaringly obvious omission was the fact that the stuff in the bottle was seriously, oceanically, azure blue. However, there was absolutely NO listing for a colorant anywhere in the ingredients. To nearly anyone else, this might simply not even matter. I mean, why NOT blue? It’s a “blueberry” serum, right? So it must be blueberries that make the serum Smurf blue, right? Even though it’s not even the color of blueberries? So what if it’s the color of Smurf juice? So what if they forgot to include blue on the label? As creators and formulators of our own skincare and bodycare products, the ubiquitous and blatant mislabeling of products in our industry is well known to us. Yet when I tell friends, family and customers about this rampant labeling abuse, they are often shocked. Like most people (and like me, before I began making my own organic body care products over 16 years ago), they assume that there are laws and regulations and governing agencies (such as the FDA) which oversee these things to protect consumers. Right? Well, mostly. There are laws. There are rules. But you may be a bit surprised to learn there is very little, if any, actual policing or enforcement of those laws. As indie beauty care artisans, we tend to take a great deal of care in choosing quality ingredients, painstakingly sourcing and blending and mixing and tweaking and testing (usually on friends and family) before finally releasing our creations into the world. And most of us follow the labeling laws. Many of us do so proudly, because we know how great our ingredients are and we want you to know, too. We pour our hearts and souls into our products, because we want to put something really good out into the world. The problem with the smurf juice syndrome is that we indie brands are trying to compete on an unlevel playing field. The company that makes the smurf juice serum happens to take out two-page spreads in every spa, salon and beauty trade publication currently in circulation every month, and they claim to be offering “handmade”products using “organic” ingredients. Yet, as a literal handmaker of bodycare products using certified organic ingredients, I can assure you that this company is not. But how is the public to know the difference? How are we, as consumers, going to make informed choices if there is no transparency and truth in labeling? When the average consumer (who is not a formulator) picks up a bottle of something called “Rose Hip Toner” and the entire sum of the ingredients reads: “Rose Hip Juice” despite the fact that the product is red—very red. And despite the fact that this “rose hip juice” smells heavily of roses. And nevermind that, if I were to go out to my wild rose bushes this autumn and squeeze the juice from the ripe rose hips and put that juice in a jar and leave it on a shelf for, say, anywhere from one to two weeks at room temperature, the result would be at least fuzzy, probably covered in mold and certainly. Not. Red. And it would definitely not smell like roses. How are you, the consumer, to know that this product has to contain more than what its ingredients label suggests? I know, as a formulator, that there would have to be some type of preservative, whether natural or chemical-based, for any kind of liquid “juice” to not decompose in a bottle, unrefrigerated, unless that juice is sold in powder form. I know, too, that it is exceedingly difficult, if not impossible, to achieve or retain a natural red color in wet products. If you were to mash strawberries into a jar and leave them there, they would most certainly turn brown (and then into compost). And I can tell you that there is a fragrance in that bottle, because “rose hip juice” doesn’t smell like roses. In fact, I am not sure that there is even such a thing as “rose hip juice”. But this company, with its big advertising budget and its clever packaging will sell you its “handmade, organic rose hip juice” toner for the bargain price of $48. There is currently new legislation being proposed to improve FDA laws for food as well as cosmetic products. And, as much as I am not looking forward to the prospect of having to pay more licensing, certifying or business fees, I think it’s long overdue. The European Union took the lead way back in 1976 with their European Cosmetics Directive, which has been improved and updated several times since, banning harmful ingredients such as known carcinogens and irritants and greatly restricting labeling nomenclature (http://ec.europa.eu/enterprise/cosmetics/html/consolidated_dir.htm). Here in the States, we’re way behind. Aside from the lack of enforcement in labeling laws, there are many substances in commercial cosmetics and beauty products today which are quite frankly, toxic. They’re toxic to humans and they’re toxic to the planet. Although the proposed FDA requirements will hopefully bring some much needed attention to the way that cosmetics are made, packaged and sold in the United States, there isn’t likely to be a substantial restriction of known harmful ingredients. There are, however, a couple of independent sites trying to bring more transparency to the formulation of beauty and skincare products, most notably the “Skin Deep” site by the Environmental Working Group, which keeps a free database of cosmetic and beauty products and their ingredients, breaking them down by safety in a rating system. Although their system is admittedly flawed and imperfect, it certainly is a step in the right direction. But regulation and databases can’t replace good common sense. You, the consumer, already have the senses to discern labeling omissions. Next time you pick up a beauty product the color of smurf juice, even though the “FD&C Blue No. 5” isn’t listed in the ingredients, you know it’s in there. In the meantime, I am going to endeavor to utilize this blog space to educate, inform and hopefully entertain those who would be so kind or curious as to read it. It occurred to me that there are hundreds of blogs out there from organic product reviews to nothing short of a shill for organic product sellers, but scant few from the perspective of the actual indie formulator. I make absolutely no pretenses as to my point of view: I am heck bent on purity, and so about purity I will write. I may also occasionally shill for my own products, too, but I promise to keep it to a minimum. Until next time, please remember not to believe everything you read, especially if it’s an ingredient label for a “natural” or “organic” product that is bright blue, yet doesn’t list a colorant, or preservative, among its ingredients. Recently I’ve received a few questions from worried customers about our use of palm oil in our organic soaps. 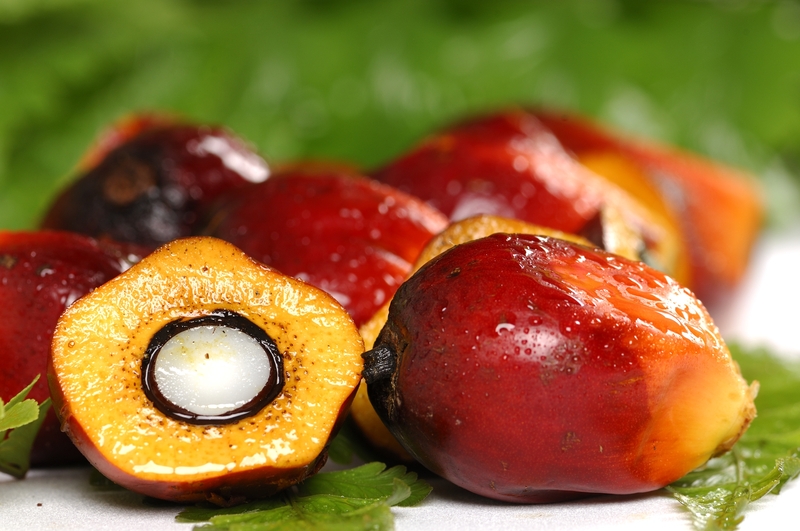 Upon the heels of the good news this week that Procter & Gamble have bowed to global pressure and have vowed to begin using traceably sustainable palm and palm kernel oils in their products, I thought this was a timely opportunity to educate and address those very valid concerns. I share that concern; it is my passion for a sustainable and socially responsible Earth that drove me to start WoodSprite nearly 15 years ago, and it is that same passion that dictates our choices and practices as a company every single day, from every one of the ingredients we choose, to the recycled papers and materials we use in our daily business and product packaging, to our energy and water conservation, to our practices of composting and recycling. I love these questions from customers and appreciate the opportunity to share knowledge. It is education and information that allow us all to make conscientious, informed decisions that better our lives and our planet. So, if you have a question, please feel free to stop by our website and reach out. I’ve received this question on occasion, and often enough that I thought I’d share my answer here in the hope that it may lead to a better understanding of the ingredients we use in our organic skincare products. Hello, and thank you for your question about our use of Borax. I can certainly understand your concerns about the use of Borax (or sodium borate) in some of our body care products, especially with the wealth of conflicting and confusing information on the internet and specifically, on the Skin Deep Database. While I do link to the database from our own website because I think it’s a wonderful resource for consumers, it is still a flawed, incomplete and imperfect system. And the EWG has even admitted as much. They have made some excellent improvements on the database recently, but as in any case of good research, one should still weigh the information against other reference sources as well. For instance, we also use a dietary-grade (for ingestion) Vitamin E in many of our products. Our Vitamin E is sourced from natural non-GMO vegetable oil (very often sunflower or wheat germ oil) and is full-spectrum, meaning that it contains all the components of Vitamin E in its complete and natural form, rather than a synthetically produced or heavily processed derivative. Vitamin E is a wonderful antioxidant and, of course, is well known for its ability to heal the skin. However, the Skin Deep Database used to list Vitamin E as a skin irritant, potential carcinogen and had a moderate hazard level of 4. Since the changes that they have been implementing, they have now made a differentiation between naturally-sourced Vitamin E and its synthetic cousins. Even with that differentiation, Vitamin E is still listed as a “low” hazard, but with a score of 2. And it still makes a very small reference to a 25 year old cancer study. If one were to take only a cursory glance at the Skin Deep Database without taking its data gaps and references with a grain of salt, they might just see the word “potential cancer” and become needlessly alarmed. Regarding Borax, I have absolutely no concerns about its use in my skin care products, and I use it regularly as part of my non-toxic cleansing regimen both at home and in our workshop because of its many wonderful properties. A natural and unique mineral found in dried up lakebeds with large deposits found in the US Southwest, sodium borate serves many purposes and industries. In cleaning, Borax mixed with water creates a minor reaction and releases very small amounts of hydrogen peroxide, which makes it a mild antiseptic and helps to inhibit microbial growth. This is also a reason it is desirable in natural cosmetics. In our products, borax softens the water phase of an emulsion (lotion or creme) which assists in binding the disparate aspects of oil and water together, without the need for chemical emulsifying waxes (which are often referred to on cosmetic products as “vegetable emulsifying wax” but are actually an isolated fatty acid fused to a detergent or surfactant which are typically petroleum derived or completely synthetic). In other words, the Borax helps to reduce the surface tension of the water-based portion of our formulas, and enables the water to stay mixed together with the beeswax and oils, and contributes to the inherent natural preservation of the formula without the need for chemical based preservatives, many of which have been linked to cancer and which have been proven to reside in the lymph and fatty tissues of the human body. Our use of Borax in our products represents 0.00297% of the formula. Certainly, there are potential health risks involved in using nearly any ingredient, natural or not. The way in which an ingredient is used, and the purpose it serves in a formula are factors that are not considered in the Skin Deep Database score, which they do attempt to specify next to the score. For instance, most of the research that I have found regarding the human toxicity of Borax applies to ingesting large amounts of the powder, and the exact amount is only estimated, not known. Furthermore, the bulk of the research is based on animal testing, with cruel trials stretching out over time in highly unlikely dosages and types of exposure (in addition, the studies included use of boric acid ,which is not the same thing as sodium borate, but is derived from it). The low risk rating on Lavender Essential Oil does not include similar references in the Database, though I’m quite certain that if one were to drink a couple glasses of it, or inject the essential oil subcutaneously, they would indeed be feeling rather poorly. But these are exactly the sorts of data gaps which the Skin Deep Database allows for, though I personally think they still need to do a little more to make that more clear. One thing I would like to stress is that I am probably the biggest stickler out there when it comes to purity in products, especially my own. I started making my own skin care formulas in my apartment kitchen nearly 20 years ago because I could not find the level of purity I was looking for in the marketplace. I have always been very chemical sensitive, especially to synthetic fragrances, and I had to start educating myself on food and cosmetic ingredients so that I could avoid the common offenders. The more I learned about the chemicals routinely used in our everyday food and body care products, the more I observed a direct link between the health of our planet and the health of humans. Especially concerning to me is that there seems to have been an increased incidence of cancer in all its forms in proportionate correlation to the use of chemicals in everything from agricultural crops to the water flowing from our faucets to the heavily processed “food” products on grocery shelves and the body care products we use daily on our skin. 14 years ago, I started selling the products I was making for myself quite by accident, and we’ve been growing ever since. I’ve turned away opportunities due to requests from large hotel chains who wanted me to change my formulas (ie: use chemical ingredients) so that I could produce in larger quantities or compete on a more economical scale, but I would not veer from my natural path. I believe that dedication to making products using only natural and organic ingredients, in as complete a form as possible, is the answer to a healthier planet, and to that of her inhabitants. I am very passionate about this, and every product I have formulated has been with that core value in mind. At any rate, I’ve compiled a little information about Borax, or Sodium Borate, for your consideration (below). It is only with information that we can make informed purchasing choices, and that is ultimately something that each of us must decide for ourselves. If I can answer any other questions, please don’t hesitate to contact me. And thank you again for your interest in WoodSprite Organic Body products. away from children and pets. mildly or moderately irritating to the skin of rabbits and guinea pigs. of formulations containing 1.1% or 1.7% sodium borate were negative. surface area of active particles to enhance cleaning power. to borax may impair fertility or cause damage to an unborn child. sure you rinse borax out of clothes and off of surfaces before use. Nothing instantaneously transforms dry, scaly skin like an exfoliating organic salt glow or sugar polish treatment, but few of us know why or how to choose between the two. For the most part, the basics for each product are almost identical, consisting essentially of oil and an exfoliant, in the form of either salt or sugar crystals. Both also perform triple duty by cleansing, removing dead skin cells and moisturizing simultaneously, with the added benefit of increasing blood circulation and oxygen to the skin, resulting in that lovely “glow”. However, depending on your skin type and when you typically use the scrub, you may want to choose one or the other. Sea salt has many wonderful qualities for the skin, not the least of which is its antiseptic properties, which cleanse, heal and detoxify at the same time as buffing away dead skin cells and speeding new cell turnover. However, because of its antiseptic nature, it can be slightly drying or irritating to sensitive skin, and no matter what skin type you have, you’ll want to make sure to use a salt glow before shaving, for it can cause stinging on freshly abraded skin. Sugar also has unique benefits due to its mild glycolic acid content–a natural Alpha-Hydroxy Acid (AHA)–which dissolves dead skin tissue chemically as well as mechanically buffing it away, making way for new cell production. Since sugar does not have antiseptic action, it can be used on sensitive skin and applied before as well as after shaving. However, for the cleanest, smoothest shave and to help prevent ingrown hairs, a scrub of either kind is best used beforehand. At WoodSprite, we offer both refining Sea Salt Glows in four aromatherapeutic scent blends, and three smoothing Organic Sugar Polishes to suit your unique needs. Please feel free to visit our website for more information. WoodSprite Organic Body was honored with the first annual Award for Best Skin Care Company by EcoBold (EcoBold.com), a leading provider of online video reviews of various green and eco-friendly products. “The contributions made by these green companies makes a tremendous difference in how people produce, consume, and think about the environment,” said Steffany Boldrini, EcoBold CEO and Founder. “Their level of commitment and dedication to making a difference with sustainable and eco-friendly products are reflections of company-wide green initiatives towards a greener future.” Companies were mainly judged by the greenness of their products compared to other contestants, and were furthermore judged on their Above and Beyond efforts in having company-wide green practices, on top of making a green product. To learn more about EcoBold, visit their website. To read the full press release, please visit this link. June 21, 2010 — Today’s Way: One of the best things you can do with your kids is to allow and encourage creative time and space for them. Kids love to get their craft on…imagining new purposes for ordinary objects at an early age exercises their fine young minds and helps develop an aptitude for critical thinking. And you know what else? It’s fun! One of my favorite craft items when I was a kid was the good ol’ ordinary toilet paper tube (along with its brother, the paper towel tube). We used to paint them, bedazzle them, punch patterned holes in them, make them into kaleidoscopes, build castle turrets (on top of cardboard boxes) with them, tape them together to make binoculars, telescopes and periscopes (complete with mirrors), we poured beans into them and sealed the ends to make rattles for our imaginary rock band…you name it, we made it. Start collecting your tubes now so that, on the next rainy day your children (or nieces or nephews, or grandchildren) are trapped inside, you’ll have a ready stash to repurpose. And get the kids involved, enlist their help to collect the tubes and make a special box for them (a box, by the way, that could also be reused and decorated just for this purpose). Believe me, when they grow up, they won’t remember their score on the video game they always played, but they will remember time well spent with you, creating fun new things out of ordinary objects that would otherwise have gone straight to a landfill or recycle bin. June 20, 2010 — Today’s Way: I’ve talked about lawns and their maintenance demands before in this blog, and that’s because the American Quest For The Perfect Lawn represents a huge chunk of the pollution pie. Inefficient engines on lawn mowers, leaf blowers and weed whackers, extravagant water usage, heavy chemicals in the form of fertilizer and indiscriminate pesticides are just some of the offenders contributing to greenhouse emissions, air pollution, human health problems from chemical exposure and the killing off of beneficial birds and bugs, not to mention global warming. Aside from not having a lawn at all, there are many clever and more Earth-responsible lawn-care alternatives that are every bit as effective as conventional methods. One excellent alternative to the use of pesticides is beneficial nematodes. Nematodes are microscopic, parasitic worms which live in almost any kind of soil and climate, and feed on grubs and other larvae that live underground for at least part of the life cycle of common insect pests, such as Japanese beetles, gnats, weevils and fleas, yet are completely harmless to humans, animals and plants. There can be thousands of nematodes of many varieties in just one handful of soil, but you can fortify your yard with specific species of nematodes which are known to effectively control specific species of other insects, as well as some types of fungi. Beneficial nematodes can be purchased in packets which can be stored in a refrigerator until you’re ready to distribute them. Then, simply moisten the nematodes with water and spread over your lawn (or garden) with a watering can or sprayer. You can purchase beneficial nematodes at your local big box home improvement store, or order them online, such as this site. June 19, 2010 — Today’s Way: Some of us may be surprised to learn that the amount of fuel savings that can be garnered by adjusting your bad driving habits is significant–on average, anywhere from 10% to a whopping 40%–depending on how much of a lead foot you have, that is. If you’re an aggressive driver (come on, you know who you are…punching the gas pedal off the line, accelerating until the very last moment, then using the brakes heavily to slow down, weaving in and out of traffic like you’re Mario Andretti), you’ll see the biggest savings by easing off on acceleration and coasting your way to a gradual stop. For the average driver, simply being more mindful of your pedal pushing can still bring notable fuel and monetary savings over time, as well as less wear and tear on your car. And fuel savings means less use of petroleum, which means less emissions, which means less green house gases, which means less pollution, which means healthier air and a better future for everyone. June 18, 2010 — Today’s Way: Picnic season is upon us! It’s time to haul out mom’s famous potato salad recipe, and to take pleasure in the flavors of summer with strawberry shortcake, fresh squeezed lemonade and delicious fruit salads. Usually, we pack all of these things up and haul them to the park or the beach or the campground, along with plastic forks, spoons and knives as well as other “disposable” dishes, to be used once and then tossed away and forgotten. The problem with this is, those plastic utensils are going to be sitting in the bowels of some landfill far after memories of that lovely summer meal, and probably even you, are long gone. Another concern is exposure to BPA and other chemicals by eating on or with plastic. The most eco-responsible thing to do is just take your regular utensils with you (or, buying an affordable set from a yard sale or Goodwill store especially for picnics and travel), and take them home and wash them for reuse, but if you’re worried about losing pieces or having to do extra cleaning after the hauling, there is another great alternative. Biodegradable utensils, cups, plates and bowls are made from plant starches and other natural ingredients, and when you’re finished using them, they can either be thrown away and will eventually break down in a landfill, or better yet, some brands are compostable, and completely disappear into organic matter within a matter of months. Most of these plant-based utensils are heat tolerant and microwaveable. Furthermore, there is no worry of chemical exposure to plastics in your food. So, you’ll be able to fully enjoy mom’s potato salad without the guilt of using disposables. June 17, 2010 — Today’s Way: This one is sooooooo easy, you’ll love it. Get out a tire pressure gauge, check your tires, inflate them to the proper level. This simple bit of maintenance can save you an average of around 10% on your gas budget, and of course, saving fuel helps to save the planet, too.